Wireless security is something that should be on every Windows 7 user’s mind. When you set up a network, you assume that only those in your home or office will be using it. However, there are people out there waiting to steal wireless Internet connections, your personal information and other data that is sent over a wireless network. There are different levels of security, several types of passwords you can use and research you should do before setting up your wireless network. 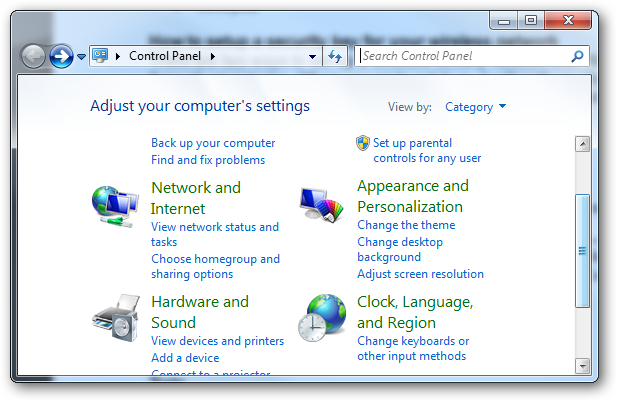 Setting your wireless security key in Windows 7 is essential to keeping your computer, network and everyone who uses it safe from harm. We have previously seen how to connect to wireless network in Windows 7, now we’ll talk about securing it. What is a wireless network security key? A wireless network security key is the password you need to access a secure network. When setting up a wireless network, you use a router to transmit the signal through an area. If the network is secure, it requires a password to access; if not, you can simply jump on it whenever you want with little effort. When hacking a network, criminals count on either a completely unsecure network to gain access to or a secured network using a common password. Common passwords are things that are easily guessed. This can include any sort of identifying information a person can get about you. If someone is serious about hacking into your wireless network, they are going to use your first name, last name, address, e-mail address and eve network ID as starters to getting into it. From there, they may try some of the most common generic passwords people use that are really unwise to use when setting up a wireless network. There are three types of wireless security encryption the average consumer should understand. They are Wired Equivalent Privacy (WEP), Wi-Fi Protected Access (WPA) or WPA2. WEP is the weakest of the three with WPA and WPA2 offering additional levels of security when creating a network password. WEP was the standard for wireless security keys for years before the introduction of WPA and WPA2. WEP was introduced in 1999 and was designed for the 802.11 standard of networking. The 802.11 networking protocol is still used today but WEP has become a way of the past due to numerous security flaws. 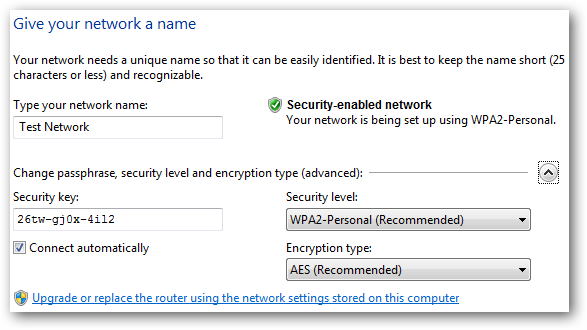 There are two ways to set up a wireless security network with Windows 7. You can do it through your router. When you go to set it up, it will walk you through the steps of setting up your network and choosing the secure it. 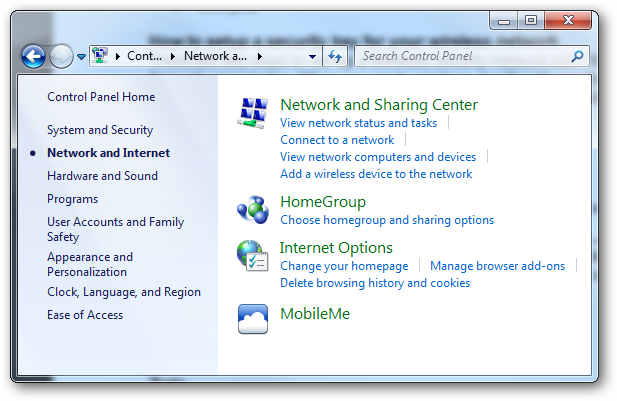 You can also opt to create a network security key through Windows 7. Since we are going to focus on using a WPA or WPA2 password, you want to make sure your router is capable of handling the protocol. Older routers may not be capable of using this type of password, if that is the case you may wish to get a new router to maintain the highest level of security for your network. Click on the “Network and Internet” header. This will open up your current network. You want to click on the “Set up a new connection or network.” This will allow you to set up any number of networks in your home or office. You need to choose your router in the next screen. It can take up to 90 seconds for your computer to pick up your router, possibly longer if this is the first time you are setting up a wireless network. 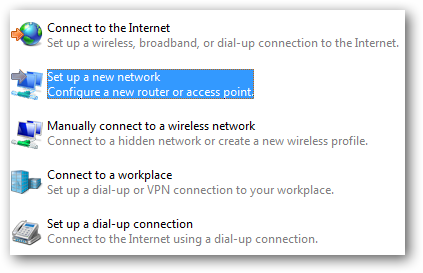 Once your router is accepted, you can now change the settings and finish setting it up securely. On this screen, you can name your network, choose your security key and set the security level. 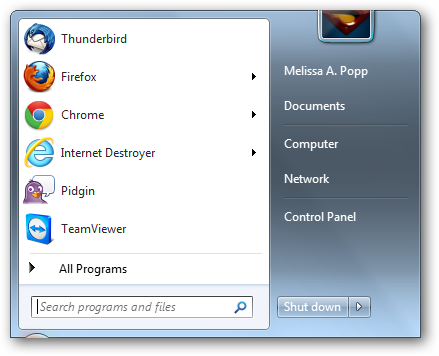 Windows 7 will automatically choose the best possible set up for your password. In this case, my router can utilize the WPA2 level of security and has automatically generated a password to use. Now, your new security key and network are ready to use. Those that are using it can rest assured that they are protected by the best possible security key create by you. Conclusion – Why should use setup a security key? If you are currently browsing the network on an insecure connection, you are opening yourself up to all sorts of trouble. Hacking, phishing, data mining and more can occur through your network. You can lose your banking information, credit card numbers and more by leaving yourself unprotected. Securing your network is a vital way to stay safe when using the Internet. 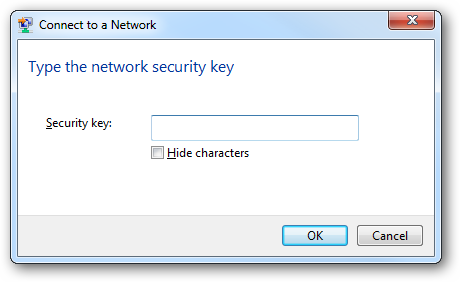 Windows 7 makes it easy to set up a secure network and create a viable security key for it. 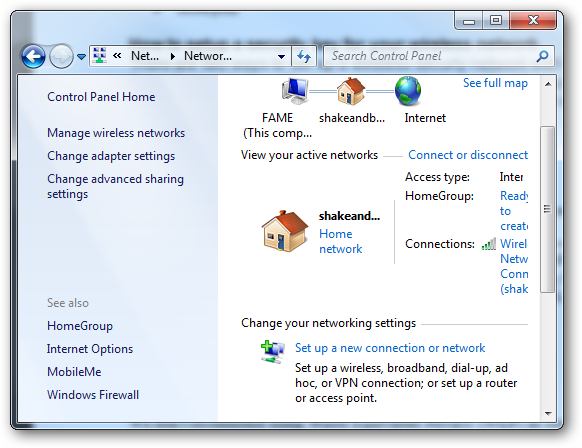 If you are not taking advantage of this feature in Windows 7, you are leaving yourself vulnerable to attack when connecting to your network.